The Master of the Vision of Saint John was an artist active in Cologne in the second half of the 15th century. His style combines the influence of Netherlandish painting with that of the school of Cologne, evident in the hard, linear style of the figures and the bold colours that recall the work of Stefan Lochner. 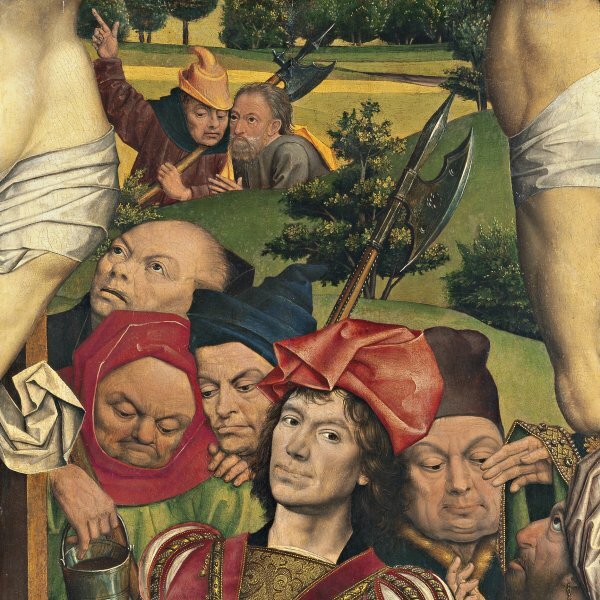 The present work represents three martyr saints: Cosmas, Damian and Pantaleon, depicted with individualised faces and positioned in a semi-circle. Their clothing is painted with a wide and rich chromatic range, while the artist has also undertaken an interesting study on the reflection of light on the metal containers held by two of the saints. Saints Cosmas and Damian, located in the centre and on the left, respectively, were twin brothers who were famed for their healing skills. Saint Pantaleon, on the right, was also a doctor, but from a different period. 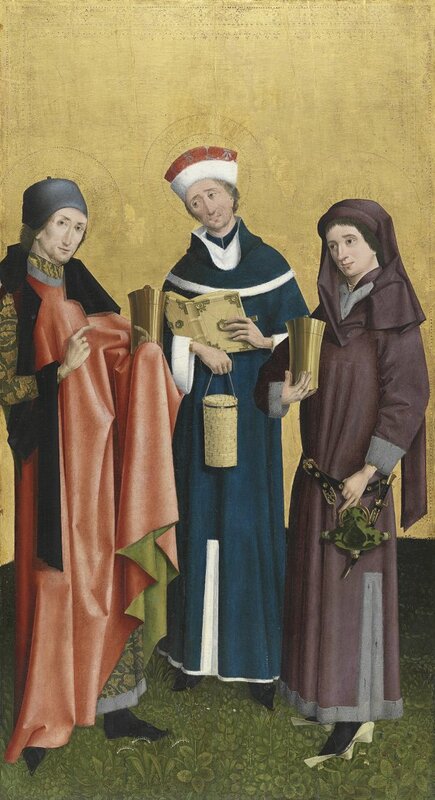 These three martyr saints are associated with the city of Cologne. These three doctor saints can be identified by the inscriptions on their haloes. Saint Cosmas in the centre and Saint Damian on the left were twin brothers whose labours to cure men and animals are recorded in The Golden Legend. Born in Aegea, they became celebrated for their professional success, offering their services free of charge. Along with their other three brothers, they were martyred on the order of the proconsul of Cilicia in 287AD during the reign of Diocletian. The Golden Legendrecounts various episodes in their lives regarding their efforts to cure people, of which the most famous was the amputation and transplant of a patient’s leg. Saint Pantaleon, depicted on the right, was also a doctor working in Nicodemia in Bythnia, again offering his services free of charge. He was martyred in the 4th century under the Emperor Maximian. The three saints can also be identified by their attributes, which relate to their professional activities. All three were associated with the German city of Cologne where Saint Pantaleon was the patron saint of an abbey in which his relics were housed, while the city also had a monastery founded in the 9th century under the protection of the three saints. The present panel, which was recorded in earlier catalogues of the Collection as a work by an anonymous artist active in Cologne, was attributed to the Master of the Vision of Saint John by Stange. Otto Fischer associated the present painting with an Adoration of the Magi in the Toledo Museum of Art, Ohio, which would have formed part of the same ensemble as this panel. The similarities between the two panels are evident in the physical types of the figures, the treatment of the gold, the designs on the brocade and the haloes, as well as other details relating to the way the figures are constructed. Lübbeke suggested two further panels as belonging to this group: an Archangel Gabriel and a Virgin Mary, which together formed an Annunciationthat was in the Deutsches Museum until 1945. The three saints are arranged in a semicircle against a gold background. The faces of the three martyrs are completely individualised and the artist emphasised a rich and elegantly combined chromatic range in the clothing, making full use of an interplay of colours, tones and textures. Saint Damian and Saint Pantaleon hold metal pots in their hands, visually exploited by the artist to depict the reflections of their fingers on the surface. The present panel was in the Wallraf collection in Cologne where it was exhibited until 1924. It entered the Thyssen-Bornemisza collection having been acquired on the Swiss art market in 1934.